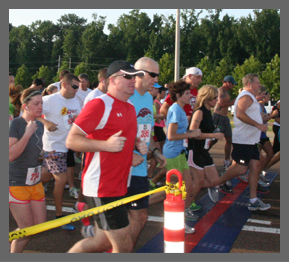 Josh Heird, 32, of Louisville, Ky., and Meggan Franks, 28, of Starkville were the overall winners of the five-kilometer Farm Bureau Insurance Watermelon Classic Wednesday morning. A record 1,772 participants celebrated Independence Day in the 30th annual event held in sunny, warm and humid weather. Heird finished the 3.1 mile run in 16 minutes, 31 seconds, three seconds ahead of second place William Kazery of Jackson. Curt Knight of Jackson finished third with a time of 16:40. Among females, Franks finished a minute and three seconds ahead of second place Mia Martinson of Ridgeland. Jemu Zarzar of Germantown, Md., was third with a time of 20:47.